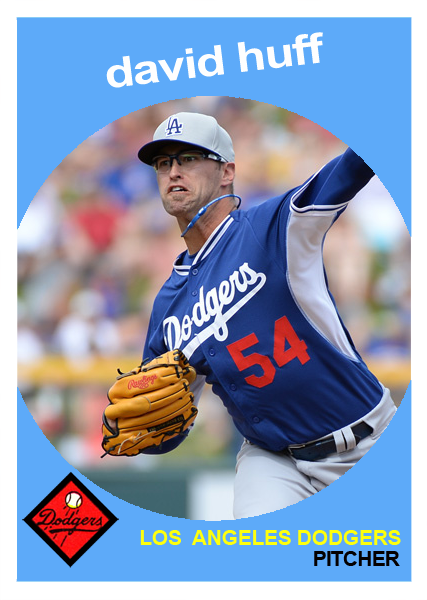 Dodgers Blue Heaven: Welcome to the Blue, David Huff! Welcome to the Blue, David Huff! What a huge oversight on my part. Veteran reliever David Huff signed a minor league contract in January, and I failed to do the courtesy of making a fantasy Baseball card for him. For that, I apologize. To make up for my obvious indiscretion featured above is said card. I grabbed a photo taken during Spring Training by Dodger photographer Jon SooHoo/LA Dodgers 2015 and the 1959 Topps Baseball card design. The #Dodgers announced David Huff will start Tuesday's game. "I'm just going to try to go as long as I can until my body literally hurts, but obviously, injury-free," Huff said. You gotta love that enthusiasm. UPDATE: via a Dodger press release, Darwin Barney has been options to AAA to make room for Huff. The Los Angeles Dodgers today selected the contract of left-handed pitcher David Huff from Triple-A Oklahoma City and optioned infielder Darwin Barney to Triple-A. Huff, 30, will make his Dodger debut as tonight’s starting pitcher against the Seattle Mariners. Huff, who will wear No. 54, last pitched on Thursday for Oklahoma City against Round Rock, allowing one run on three hits in 3.0 innings of relief in a 50-pitch appearance. He was a non-roster invitee for the Dodgers at Spring Training and went 2-0 with a 1.32 ERA in six games (three starts).